Thomas Lessman is a political activist, computer specialist, and amateur world historian from Topeka, Kansas. More information about Thomas is available on his personal website, www.ThomasLessman.com. This user is a member of WikiProject Atlas. A Message from Thomas Lessman: "The main reason I'm on Wikipedia is because I appreciate its potential to improve our understanding of history. During my studies of history, I've been disappointed by the lack of comprehensive maps that cover wide areas during specific years." "Finally I realized that if I wanted better maps, I'd have to create them myself. So I pieced together this blank map template, based on this topographic map." I have no bias towards or against any nations. If you see a possible error, it was an honest mistake! I do the best I can with the information I have. I don't make any claims of perfection in these maps! Keep in mind that source information is often incomplete or conflicts with other sources. I do the best I can with the information that is available to me. Constructive feedback is appreciated (especially if it helps improve the maps!). Most feedback has been positive and helpful. A few people have complained about the maps, saying they are sub-par or even worthless. To those who complain about them? Either help improve them or try to do better! Each map's homepage has a File History section, which contains a list of previous versions of the map. When I get enough feedback, I update the maps with corrections and upload the new versions to Wikipedia. To report any potential errors, or if you are interested in helping this project, please see my Corrections & Project Help section. For the gallery of maps I've uploaded to Wikipedia, visit User:Talessman/Maps. Bold dates are available on Wikimedia or Wikipedia. see Wikimedia's Template:Maps of world history. Several new maps are currently under construction, and corrections are also being made to some existing maps. All will be available at www.WorldHistoryMaps.info when they are complete. You can help! Please email me, Thomas Lessman, at talessman yis.us. 2. Your source information, so I can see the information directly and add it to the list of sources for each map. NO SOURCES = NO CHANGE. Period. I simply CANNOT make any changes without source information to justify the change. Please and Thank You! I appreciate all help and feedback about these maps, especially if it helps improve them! I'm always happy to give credit to those who help, unless they prefer to remain anonymous. Thank you in advance! My blank map template is based on this topographic map, which I pieced together using Adobe PhotoShop. I've made the blank map available on my website (Shortcut: blank-East-Hem.jpg). 3. Wikimedia maps of World History, created by User:Briangotts and User:Javierfv1212. 4. Early British Kingdoms maps of British history, available at www.EarlyBritishKingdoms.com. 5. Columbia University's "Maps of South Asia: an organized collection". 6. DK Atlas of World History, 2000 print edition. 7. Frank Smith's Macrohistory and World Report, available at www.fsmitha.com. (Mostly used for info about various Asian nations). 9. University of Texas Historical Map Resources, available on the University of Texas website. 11. 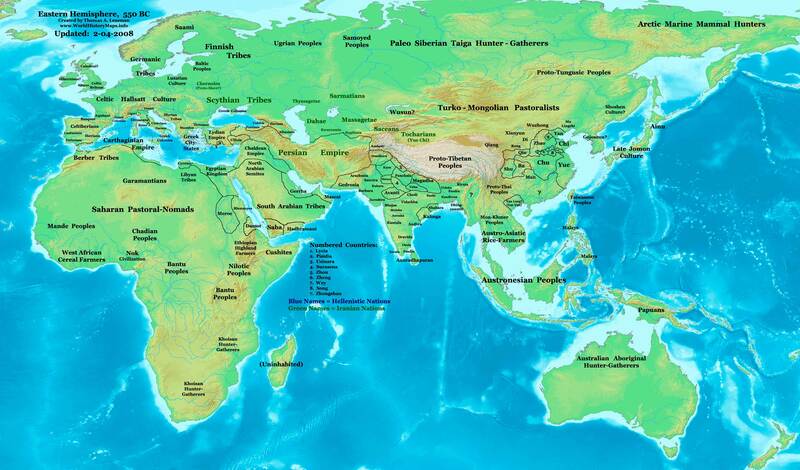 Huhai.net maps of Asian and Chinese History . 12. Maps of Korean History by User:Historiographer. 13. Various Wikipedia articles provided some information that I used in these maps. 14. Also several people have sent me information to help correct minor errors or add missing information. Wikipedians who have helped me make map corrections include: Quantum cyborg, Briangotts, Cplakidas, Gantuya eng, Bogomolov.PL, User:Javierfv1212, and User:Historiographer especially have contributed to the development of these maps, either by directly sending me information or by making their own maps available for reference. This is a Wikimedia Commons user page. If you find this page on any site other than Wikimedia Commons, you are viewing a mirror site. Be aware that the page may be outdated, and that the user this page belongs to may have no personal affiliation with any site other than Wikimedia Commons itself. The original page is located at https://commons.wikimedia.org/wiki/User:Talessman. This page was last edited on 12 May 2008, at 17:57.